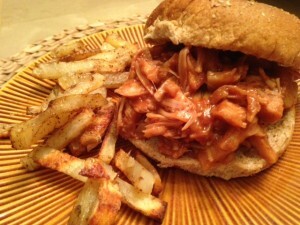 BBQ Pulled Jackfruit – Delish! Yes, you heard it right. BBQ Pulled Jackfruit is now one of our favorite sandwiches! BBQ Pulled Jackfruit – simmer at least 30 minutes. It’s basically 2 cans of jackfruit in water or brine (purchase young green jackfruit, not ripe)….you can find it easily at your local Asian store. 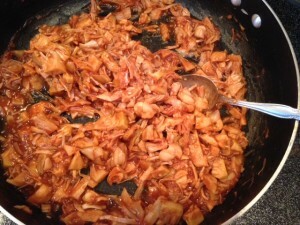 Tear or chop the jackfruit into small strips. Saute in in a little water (as needed, not too much) with garlic, onion, and a smidge of smoked paprika. Make it hotter by adding cayenne if you dare. Make your favorite, healthy BBQ sauce, or purchase a good one that doesn’t contain sugar, corn syrup or oils. The best sauces use molasses or maple syrup as the sweetener, along with vinegars, soy sauces, mustards and other flavorings. There are several recipes on line, or contact me. This gets better the longer it sits (if you can wait). Serve up on a whole grain bun with a side of Fit Fries and life is good!